The UEFA Champions League group stage draw was held on Thursday in Monaco where thirty two teams that qualified for the big tournament were divided in eight groups. Two teams from each group will advance to the Round of 16. On this page we take a look at the initial odds for each team to make it out of their respective group. 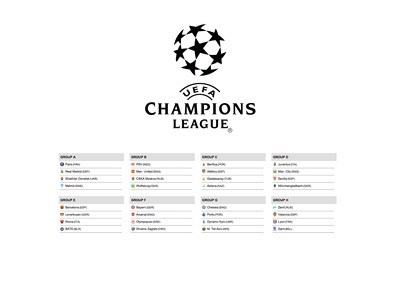 It is so nice to have the UEFA Champions League back. Every group is interesting in it's own way. Group D looks the toughest. We will preview the big games a few days before kick-off.